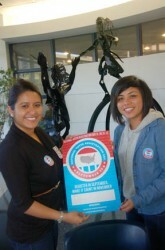 (Left to right) Chicago Votes volunteer Claudia Telles and Chicago Votes volunteer Melanie Maglaya help to increase voter registration during National Voter Registration Day Tuesday, Sept. 25. In an effort to engage future leaders to vote, Chicago Votes orchestrated a citywide voter’s registration event with the help of 40 organizations in honor of National Voter Registration Day, Tuesday, Sept. 25. National Voter Registration Day was just the kick-off to many events Chicago Votes will be hosting throughout the City of Chicago until the November elections. Next month, Chicago Votes plans to host several events to boost voter registration; among them is Trick Or Vote on October 30 to 31. If you would like to learn more about Chicago Votes or how you can get involved, visit www.chicagovotes.com.